The Greek original of this verse calls us to give thanks “in everything” (en panti). This does not mean that we must give thanks for everything, as if everything, including evil, was from God. It does mean that even in the midst of suffering, even when we experience injustice, even when life isn’t working out as we wish, we can and should give thanks. We thank God for his good gifts. We thank him for being present with us in hard times. We thank him for using life’s struggles to draw us closer to him and make us more like him. We thank God that nothing is outside of his wise plan for our lives, even when we can’t understand that plan. Why should we thank God? 1 Thessalonians 5:18 reveals that “this is God’s will for you who belong to Christ.” Giving thanks to God is what God desires for us. It’s a matter of obedience. We do it because God wants us to. But we thank God, not only because it is right to do so, but also because through thanksgiving we receive abundant blessing. When we thank God, we remember all that he has done for us and feel glad. In thanksgiving we find security and peace of mind. Giving thanks opens our hearts to trust God more, so that we might be ready for new blessings. In gratitude, we savor life’s goodness, and therefore live to the fullest. QUESTIONS FOR REFLECTION: How have you been able to thank God in the midst of difficult times? For what are you most thankful today? PRAYER: Dear Lord, first of all, I must confess that I don’t always obey this verse. I am thankful at times, but surely not in all circumstances. When things are hard, when life is scary and disappointing, it’s hard for me to give you thanks. When I look back upon difficult times, gratitude comes easily, because I can see you at work. But, in the moment of suffering or sadness, I often have a hard time giving thanks. Forgive me, Lord. Help me to do what this verse encourages. May I be truly thankful in all situations. By your Spirit, remind me of your goodness when I’m in hurting or afraid. Make your presence known to me, Lord, so that I might offer you thanks. 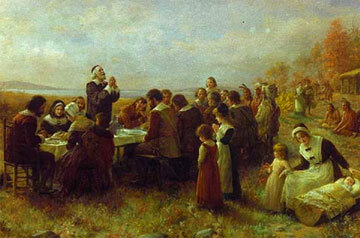 On this day of Thanksgiving, may I join the chorus of thanks to you. For all you have given me, and most of all, for your love and grace in Jesus Christ, I thank you. Amen. This devotional comes from The High Calling of Our Daily Work (www.thehighcalling.org). You can read my Daily Reflections there, or sign up to have them sent to your email inbox each day. This website contains lots of encouragement for people who are trying to live out their faith in the workplace. 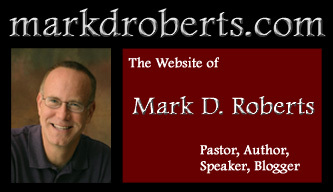 Rev Mark Roberts & Family, Happy Thanksgiving & THANK YOU for today’s daily devotional post you gave. Thanks for the warmth & caring you inject in your computer messages. The world & the readers need it! Also, thanks again for the photos & illustrations that accompany your post. They are excellent! I wonder if yesterday’s post showed your son working perfectly & excellently on a building project. What Teamwork!! Again, Love & Prayers J & Family Soon after the holidays, we can say Happy New Year! Hope you & your family are enjoying Texas- without a doubt 1 of the friendliest spots on earth-California needs that friendlier spirit - Ha!